Oh, and is anyone familiar with these 4.2 engines as far as timing goes? Static timing should be 8 degrees BTDC - do they take a bit more like the Landy V8’s? The North American spec is 10 degrees, not sure why the difference but I’m guessing that won’t hurt. Just wondering if anyone’s played with them much? So, a properly working dizzy cap has made a great difference, as you’d expect. Changed plugs, cap and rotor button. Plugs all looked fine and even but a bit black which confirmed my thoughts it was running rich (you could smell it too). Pulled the air cleaner assembly off so I could tune the carbs now I was happy with everything else. Front carb was waaaaaaaaay out of whack - blind and deaf Freddy could have heard it. Balanced them by ear and set the mixtures as best I could (will take it in for a proper tune at a place recommended soon) But I got the idle much smoother although not perfect - think I’ve got a small vacuum leak too but couldn’t track it down. Back together with everything and took it for a test run - gave it a fair bit of stick to burn some oil off the exhaust manifold and to see how it went - and it goes very well. Probably a fraction more power than before but a lot smoother through the rev range and it seems to kick down to second a bit easier now - really had to sink the boot in before. Maybe I’m imagining it, but it ran a bit cooler too - didn’t get it over the ‘N’ in ‘Normal’ which it hasn’t sat at before. Even gave the AC a blast but it was a beautiful ‘Windows Down’ afternoon yestereday - about 28 degrees, very comfortable motoring. Sooooo, what happened on the weekend I don't hear you ask, but I'll tell you anyway. After spending 3 days working on the Jag going over it all, servicing and tuning it up, it was running beautifully. Took it for a decent run (about 80KM) on Saturday and it didn't miss a beat - got a bit warm through traffic heading home after going to the shops, so checked the viscous when I got home - engine was in the mid 90 degrees - it free wheeled - I suspected as much, but that's fine, as soon as you get going it drops back to the mid 80's. A job for another day. Sunday arrives, I jump in it and start it up to go fill up ready for when Grey_ghost and missus grey_ghost got here about 11am and we head up to Ballarat for a club activity and evening meeting. Checked gauges - low oil pressure - about 10PSI ... WTF??? It's always sat on 40! Check over everything, oil leaks, etc. Give the wire on the oil pressure sender a wiggle and I've got 40PSI back - good news, loose wire. Off I go to fill up, and back in the driveway no probs. So, just finished fitting a new oil pressure sender - works great, and also a new viscous hub - turns out an early Range Rover hub is identical - I had an almost new one still on the shelf from when I replaced it on the 3.5 then swapped to the 3.9 only a few months later, so that's a decent saving. Not hard to fit and feels much better, so will see what it's like in traffic next time I'm out. Some say these vehicles have overheating issues and some say they don't. The fan is a huge 12 blade job, so with a new viscous hopefully all should be well - I think most people that encounter overheating don't try and get the coolant system back to proper working order, rather stick a set of thero fans on it and say they've fixed it. Given I've driven it on a 33 degree day on the highway with the AC going and it was fine - ran in the high 80's, I'm guessing overall the cooling package is suitable. 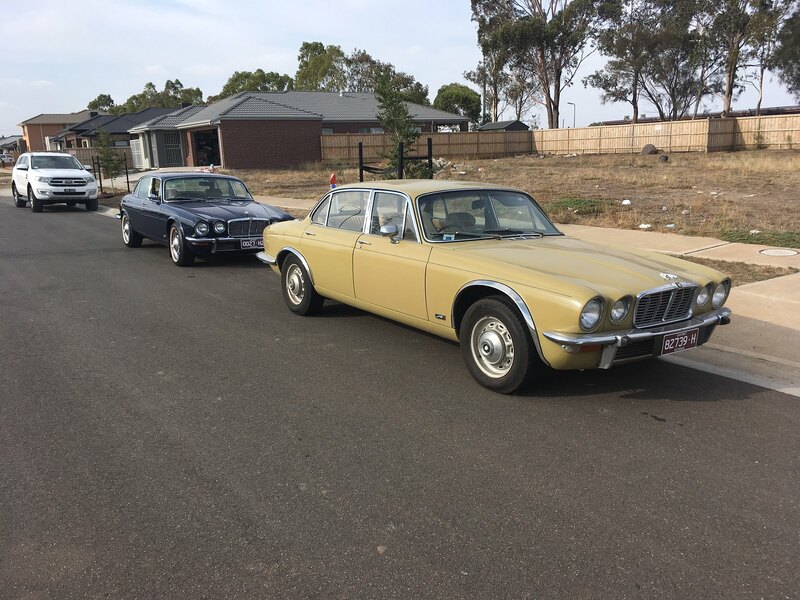 Hopefully that's all I need to do on the Jag for a while and I can just enjoy it, as the 101 is about to get a whole lot done to it - stay tuned on that thread for a bit of a run down there. All times are GMT +10. The time now is 07:05 PM.